More than any other military conflict, World War II took its toll on major-league baseball and its players. And it was while fighting overseas during the Battle of the Bulge that Corporal Ernie White “was pinned down in icy water for a day” and -- perhaps as a result -- ultimately reported to have lost his fastball. White was among several members of the St. Louis Cardinals serving in the military then, including Harry Walker, Lou Klein, Al Brazle, and Howie Krist. All told, 10 St. Louis pitchers were called to duty during the war years of 1944-45. Neither Krist nor Johnny Grodzicki sufficiently recovered from wounds suffered in battle and neither won another big league game. Meanwhile, 1942 rookie phenom Johnny Beazley ruined his arm while pitching for an Army team in an exhibition against the Cardinals, seriously affecting his career. Prewar prospect Hank Nowak paid the ultimate sacrifice. After landing a contract with the Cardinals in 1941, he played for the Camp Lee team in Petersburg, Virginia. He died on the battlefield during the Battle of the Bulge on January 1, 1945. White was more fortunate, although he also spent the better part of that winter freezing through the same awful battle in the Ardennes. After showing promise in the 1941 season, when he won 17 games for the Cardinals, White came home from the war with what was termed “a dead arm” and never matched the promise of his early career. Ernest Daniel White was born on September 5, 1916, in Pacolet Mills, S.C., and pitched a total of 12 years of organized baseball. It was while pitching for a textile mill team in Pacolet that the southpaw was discovered in 1937 by Frank Rickey, the younger brother of Branch Rickey and a scout for the Cardinals. He’d already been married; two days after he turned 17, he married Margaret Whitlock. Soon after signing with St. Louis, the 20-year-old White pitched for both the Martinsville (Virginia) Manufacturers in the Class D Bi-State League and the Asheville (North Carolina) Tourists of the Class B Piedmont League. Asheville played its home games at McCormick Field, which much later was the location for a scene in the movie Bull Durham as the ballpark where the Kevin Costner character Crash Davis hit his minor league record-breaking home run with the Tourists, after his release from the Bulls. White was 0-2 for Asheville (and may have appeared briefly for Martinsville, without recording a decision), and was moved in 1938 to the Portsmouth (Ohio) Red Birds of the Class C Middle Atlantic League. The team was owned by the St. Louis Cardinals, and Ernie’s teammates included Walter Alston and Whitey Kurowski. White made his first big splash with the Red Birds on June 3, 1938, against the Johnstown Johnnies when, according to the 1940 National League Green Book, he struck out an incredible 15 batters in a five-inning stint. He finished the season with a 15-6 record and received an honorable mention for the league’s All-Star team. The next season found White with the Houston Buffaloes of the Class A1 Texas League under manager and vice president Eddie Dyer, a former St. Louis pitcher of the 1920s who later managed the Cardinals from 1946 to 1950. White’s teammates included Johnny Hopp and Red Barrett, later teammates of his in St. Louis and Boston. The Buffaloes captured the Texas League championship with a 97-63 record before losing in the first round of the playoffs. The club was loaded with pitchers. In addition to White, the mound corps included future Cardinals Harry Brecheen, Murry Dickson, Howie Krist, and Ted Wilks. Dizzy Dean, a former big league MVP in the waning years of his career, was also with the squad. His great fastball gone, Diz posted a 6-4 record. On July 18, 1939, White pitched the first no-hitter by a Houston pitcher since 1920, a 2-0 victory over Fort Worth. He was 15-6 and finished second in the Texas League in strikeouts with 149. From there, a stint with the Double A Columbus Red Birds of the American Association beckoned in 1940. This was the top St. Louis farm club, and Ernie impressed, leading the league in winning percentage with a 13-4 record and in ERA (2.25). Five of his victories were three-hitters. Early in the season, White was called up to the parent Cardinals, for whom he made an impressive debut on May 9, 1940. Relieving shelled starter Murry Dickson in the second inning, he pitched 7 1/3 strong innings of six-hit relief to beat the Phillies, 8-4, at St. Louis -- aiding his own cause with a perfect day at the plate (three-for-three with a walk). In eight games with the Cardinals, Ernie was 1-1, starting a contest on May 14 and receiving no decision in a 4-0 loss to the Phillies. In 1941, White came up to the Cardinals to stay, and his first full year in the majors was by far the best of his big-league career. He appeared in 32 games, starting 25, and compiled a 17-7 record with a 2.40 ERA, third best in the circuit. He finished sixth in the MVP voting. White picked up a victory in his first start, against Boston on May 5, winning 5-1. He pitched back-to-back shutouts against Brooklyn (3-0 on June 15) and New York (6-0 on June 21). For a while in midseason Southworth used his hot left-hander more between starts, and a 9-2 win over the Braves on July 26 marked Ernie’s fourth win in five days -- a 20th century major- league record. His other wins in the stretch, all in relief, came against the Giants on July 22, 23, and 24. From July 18 to August 10, in fact, White won eight straight games that he appeared in (including six in a 17-day stretch). Then, after a setback at the hands of Pittsburgh caused in part by his own throwing error, he pitched a 2-0 shutout over the Giants as the Cardinals drew to within a game and a half of the first-place Dodgers heading into the season’s final five weeks. St. Louis wound up finishing second, 2 1/2 games behind pennant-winning Brooklyn, but White had been spectacular. He had career highs in complete games with 12, shutouts with three and strikeouts with 117. In 210 innings he allowed 72 runs, just 56 of them earned. A sore arm sidelined White for part of the 1942 season as his win total dipped to seven. His arm problems began in spring training while he was trying to develop a curveball. As his arm was coming around in midseason, he was hit by a line drive off the bat of Pittsburgh’s Elbie Fletcher, which knocked him out of action for four weeks. Despite White’s setback, the Cardinals won their first pennant since 1934 with a pitching staff led by Mort Cooper (22-7), Johnny Beazley (21-6), Howie Krist (13-3), and Max Lanier (13-8). White appeared in 26 games, starting 19, and posted a 7-5 record. He had seven complete games and one shutout, pitching 128 1/3 innings and compiling a fine 2.52 ERA. After his sporadic accomplishments during the season, the highlight of White’s year -- and career -- came when he was called upon to start the pivotal third game of the 1942 World Series against the American League champion New York Yankees, with the series tied at one win apiece. Pitching in front of 69,123 fans at Yankee Stadium, White struck out six and did not walk a batter as he hurled a complete-game six-hitter to shut out the Yanks, 2-0. He became the first pitcher since Jesse Haines in 1926 to blank New York in a World Series contest, and St. Louis went on to take the fall classic in five games. It was hoped that White’s brilliant October performance would be the springboard to a return to ’41 form, but injuries hampered him again in 1943. In another freakish play, he bumped into the dugout at Ebbets Field on May 18 while backing up a throw from the outfield, suffering a shoulder injury. He was forced to leave the game in the seventh (he still got the 7-1 win), and was ailing the rest of the year. He wound up appearing in just 14 games, starting 10 and pitching five complete games with a 5-5 record and one shutout. White’s continued struggles notwithstanding, the Cardinals captured another pennant and were back in the World Series with the Yankees. This time Ernie’s lone series appearance was much less memorable than his big win of the previous year; in the seventh inning of Game Four, he pinch-ran for pinch-hitter Frank Demaree, who had reached on an error. It wasn’t until the last game of the Series (won by the Yankees in five contests) that White realized he had broken a bone in his shoulder in that May collision at Ebbets Field. White missed the entire 1945 season while serving in the Army. As it turned out, future Braves teammate Warren Spahn also saw action at the Battle of the Bulge, earning a Purple Heart and Bronze Star for his heroics. Both made it home without crippling injury, but Spahn’s postwar pitching experiences had a much happier ending than White’s. After returning from the war, White was released by the Cardinals during spring training because of his continued arm troubles. The Braves signed him a few hours after his release, however, outbidding several other clubs. Apparently teams were still thinking that White might rebound. Ernie became the fourth player picked up by the Braves from manager Billy Southworth’s former team within the year, following Mort Cooper, Johnny Hopp, and Ray Sanders. Soon, former Red Birds Danny Litwhiler and Johnny Beazley also followed suit. Boston sportswriters whimsically referred to the Braves as the “Cape Cod Cardinals” because of Southworth’s preference for his former players. During White’s three years with Boston, Southworth attempted to work him back into shape through the unique arrangement of employing him as a coach while also pitching him mostly in exhibition games with the hope that his arm would come around. The on-field results, unfortunately, were not successful. During 1946 White appeared in 12 games, starting just one and notching a 0-1 record in 23 2/3 innings. The Braves were developing a pitching staff that would help propel them to the pennant two years later. Johnny Sain returned from the military to win 20 games, and Warren Spahn also collected his first eight of 363 career victories that season after his stint in the war. Boston wound up finishing in fourth place. White showed occasional improvement, and at the 1947 Hall of Fame game at Cooperstown, he held the Yankees to four hits in five innings. But he pitched in only one regular-season game, against Brooklyn on September 28, when he started and pitched four shutout innings. He allowed just one hit, but Johnny Sain came in and wound up with the 3-2 victory. When the 1948 season began, the Braves still hoped White could attempt a comeback on the mound. Since it appeared that his arm was on the mend during spring training, he was released as a coach and signed as a player. Freddie Fitzsimmons was brought in to coach, resigning as the general manager of the Brooklyn Dodgers football team. This time the results were a bit better; Ernie appeared in 15 games, compiling a 1.96 ERA with two saves in 23 innings for the NL pennant-winners. But it was apparently too little too late. His final appearance was as a pinch-runner on October 3, 1948, in a game against the Giants at the Polo Grounds, Boston’s final game of the regular season. White didn’t pitch in the World Series against Cleveland, and the Braves released him on October 28. He was 32. Looked at as a whole, White’s early success and later struggles make him the consummate “what if” player. His seven-year major league career resulted in a 30-21 record in 108 games, with six saves and five shutouts. He pitched 489 1/3 innings, with 57 starts, 24 complete games, and 244 strikeouts. As a reliever he was 5-3 with six saves, and his fine lifetime ERA of 2.78 indicated just how good he could have been had injuries and war not intervened. He was also a strong hitting pitcher, batting .209 in 163 career at-bats, including his stellar 3-for-3 debut. 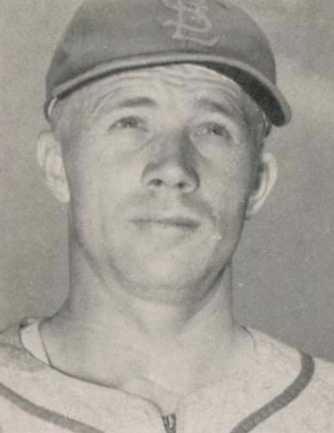 With his playing days over, White was given a position with the Braves organization managing the Bluefield Blue-Grays in the Appalachian League (Class D) in 1949. He led the club to the regular-season pennant with an 88-34 record as well as the playoff championship. The next season, White moved up to the Evansville Braves of the Three I League (Class B), and brought them in at 56-70. In 1951, he managed the Central League Charleston Senators, in the Cincinnati Reds system. He settled in and managed the Columbia Reds of the South Atlantic League from 1952 through 1955. Once again, his success was immediate as his Reds won the Sally League regular-season pennant with a record of 100-54 before losing in the first round of the playoffs. The next year they won 92 games to finish second, then won the league playoffs. He skippered the Nashville Vols in 1956, but the team finished last in the Southern Association. He spent one year back in Columbia, now a Kansas City farm team in 1957. Switching to the Milwaukee Braves system, he was equally proficient, copping pennants as manager of the Midland Braves (in 1958) and Austin Senators (in ’59). He had less success while with the Yankees organization. Appointed manager of the Augusta Tigers of the Sally League in 1962, he came in sixth, although he did manage future Yankees Pete Mikkelsen, Roger Repoz, and Dooley Womack. White’s one big-league coaching shot outside Boston came when he served as the second pitching coach in New York Mets history in 1963. Coming off their 40-120 maiden season, the Mets moved up to 51 wins and had a vastly improved ERA of 4.12 (it had been 5.04 the previous year). Still, White was back in the minors the next year in a managerial post with the fifth-place Williamsport Mets of the Eastern League. Future “Miracle Met” standout Ron Swoboda was among his players. That was his last pro managerial stint. Denied a long career in the majors despite his noble comeback efforts, or a cushy coaching spot later on, White was also denied a long, comfortable retirement. On May 22, 1974, while in for surgery to remove bone chips in his knee, Ernie White died in Oliver General Hospital in Augusta, Georgia. The Spartanburg, South Carolina, resident was just 57. He is buried in Pacolet Memorial Gardens in Pacolet, South Carolina. Baseball Page, The -- Ernie White http://www.thebaseballpage.com/players/stats/whiteer01. Historic Baseball -- Ernie White http://historicbaseball.com/players/w/white_ernie.